1. Download Grammarly from here. 2. Install it on your computer. Before you run the installation file, make sure you closed all Office applications. The Grammarly add-in works with Microsoft Office 2003, 2007 and 2010. Once you have installed Grammarly, open, for example, a Microsoft Word document and click on the tab Add-ins. Grammarly will be visible on the ribbon along with other installed add-ins in MS Word 2010. Click on the button to receive your free report. The Grammarly icon appears on the home ribbon tab as well. If you are not a registered Grammarly user, you will be prompted to create a free account when you first run a grammar check. 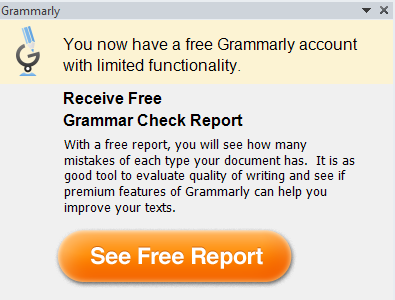 A free Grammarly account entitles you to run a grammar check and receive an online report. A free report shows you the how many mistakes you made and what type of mistakes you make most commonly. 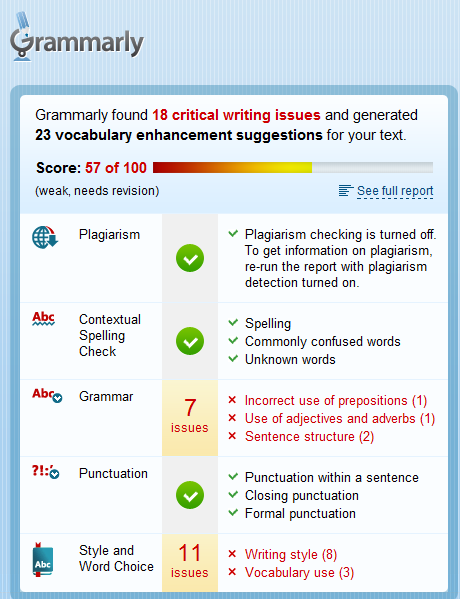 This is a good tool to detect grammar errors and evaluate your writing style and structure. If you want a detailed report with error descriptions and suggestions on how to correct them, you will need a paid subscription. Another useful and powerful desktop software is Ginger. Ginger Grammar Checker & Spell Checker provides corrections for spelling and grammar mistakes in MS Word, Outlook, PowerPoint.